The visitors had the benefit of a strong wind gusting over their left shoulders as they kicked off up the slope and asked early questions of the home defence. Wanderers settled quickly and were unlucky to be recalled for a forward pass with a clear path to the line. Marius Thompson’s elusive runs set the early tone for a vibrant performance from Thanet’s backs today. Gravesend looked to use their big runners but again the home defence with Adam Gaddes and Danny Clement prominent withstood the attack. Wanderers were dangerous with ball in hand with Tom Walton and Charlie Knight constant threats. After 15 minutes a penalty put Wanderers close to the opposition line. Andy Letts caught and Neil Wakefield marshalled the maul as it drove over for Wakefield to open the scoring. Gravesend attacked from the restart and took the three points from a penalty. Five minutes later the visitors took a 6-5 lead through another penalty when Wanderers strayed offside. Wanderers regained the lead after sustained pressure brought a penalty. Playing a long advantage, another maul was halted and the ball released to Dan Hill. His nicely timed pass to Knight gave the winger space to power through for a good try which Sam Rolfe converted for a 12-6 lead. Wiecaszek needed stitches to his head and had to withdraw. Andy Letts moved to the front row from No 8 and Dave Lemon replaced him. In the final minute of the half Wanderers surged strongly into the opposition half but the move broke down and today’s excellent referee Michael Maple was signalling the end of a nip and tuck half that had been played at a breathless pace. Wiecaszek returned for the second half and the game continued at a high pace. Wanderers were playing exciting rugby and keeping the visitors penned in their own 22. Brett Scott was instrumental in a turnover and he and Reece Hougham made big tackles. Knight broke and the ball went through hands before another close call deemed the final pass to be forward. 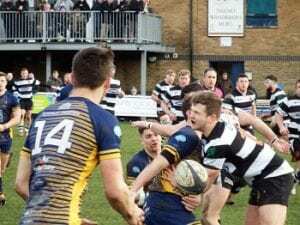 Wanderers were dominating possession and field position and building towards a third try but dogged Gravesend defence denied them until the game was in its final quarter. 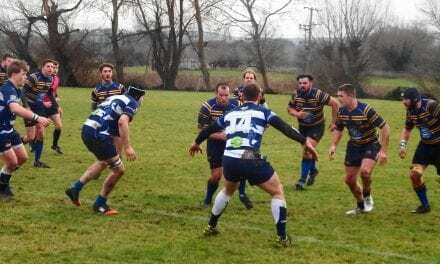 Stuart Plumridge acted as first receiver and broke the line before offloading to Dan Hill who completed a quality try. Rolfe added the extras for 19-6. The wind was growing stronger as the storm clouds gathered. Arek Janeczko after another whole hearted performance reluctantly left to be replaced by George Orton who made an immediate impression in the second row. Wanderers continued to press and desperate defence from Gravesend brought another penalty in front and 25 metres out. Rolfe duly converted for 22-6. 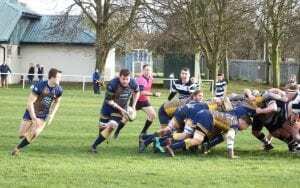 Sam Taylor took a brief break after another fine shift in the back row but was soon to return to replace the injured Letts. A rare sortie from the visitors into Thanet’s half was repulsed by a wonderful clearance kick from Walton. Time was running out as Wanderers mounted a final attack. 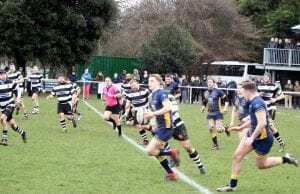 Nick Herbert found left wing Knight who powered over the gain line before finding Hougham from the opposite wing in support to score a worthy try to claim a bonus point. 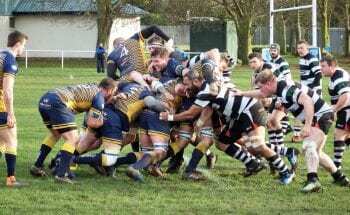 Rolfe’s conversion from the touchline was superb and Wanderers were 29-6 winners. This was a fine victory for Thanet founded on their superior fitness and a massive defensive performance that never allowed the visitors the opportunity or space to play. Wanderers backs were a constant threat and played with speed and greater patience today. The forwards put down an early marker with the try from a maul and from one to eight plus George Orton and Dave Lemon from the bench were first rate throughout. Brett Scott was back at his marauding best and lived up to his reputation as Thanet’s tackle machine. He was the well deserved winner of the Thanet man of the match award and collected the Malachy Egan award from Head Coach Mike Pond.